Brown sugar, electric cigarettes, and sculpture. Overpriced, all three, all the time. And hard to get here, all three, most times. No doubt, availability of things, their prices, depends on location. Enough learned of over-determinism; distributive economy, overrated. Point is, all three things I want here, and wont it now appears to be. Sea, sí, I want to get rid of that refined dust that spoils my morning coffee, and instead feel the more brittle texture of its sandy sister on my tongue; want to blow scentless, evaporating clouds in environments prohibiting the dragon smoke of my reds; want to quit images for a moment, be compelled to walk around shaped matter that draws me, it, beyond a picture. I want some kind of gravitational force. Just that is what I want for now. And here, without that, no magnet around, I am left to fingertips tap dancing passwords into portals where imagination machines are said be treasured. Once in, says so, one floats among some kind of cumulus monotypes that rain experience. Weather permitting. 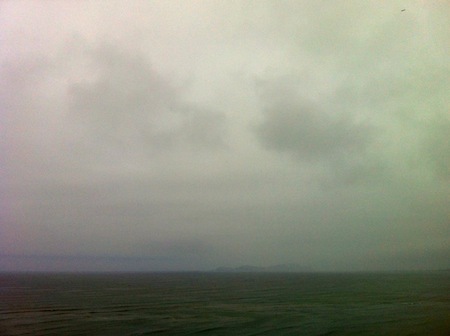 Image: somewhere in the Pacific.